Easter is one of our favorite weekends up here — and this year, it looks like we’ll have snow and sunshine. Perfect for sneaking in one more getaway before the ski season ends on April 23. Our lodging partners even have some great Spring Specials. Ski with the Easter bunny! The Easter bunny will be out on the slopes with pockets full of candy. 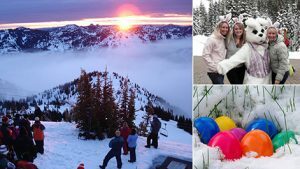 Come to an incredible Easter Sunrise service at Crystal Mountain’s summit. This is an unforgettable experience. The Alpine Inn will be hosting an Easter egg hunt on Sunday at 12:30 p.m. Drop off 12 candy-filled eggs by 11 a.m.
And there are other things happening Easter weekend as well. A R’Apres Ski Party, hosted by Rainier Beer at the Summit House on Friday and the 1st Annual Mike Brooks Bobblehead and Brews celebration on Saturday. Don’t let the weekend pass you by! Reserve today before our lodging partners sell out.